I just can’t resist fresh peaches at the farmers’ market. Which means I usually end up coming home with way more than we can eat. 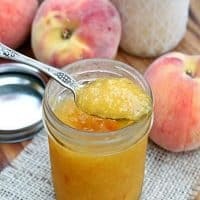 But when preserving peaches is as simple as this recipe for Easy Peach Freezer Jam, there’s really no such thing as too many peaches. I already mentioned how easy this jam is! It’s one of the reasons I love freezer jams in general. No standing over a hot stove in the middle of the summer. 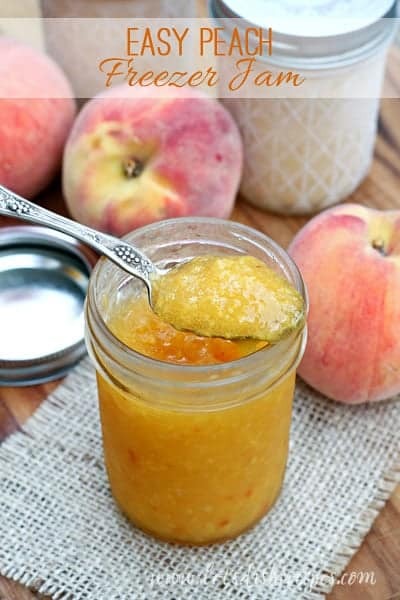 You just stir together your coarsely pureed peaches with some sugar, lemon juice and instant pectin, then put the mixture into jars and freeze. You’ll get about four 8-ounce jars from this recipe. The jam will keep in the refrigerator for up to 3 weeks, and in the freezer for a year. 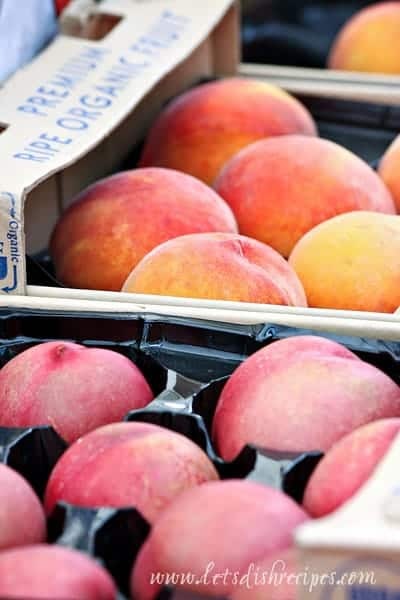 When choosing peaches, look for fruit that is deeply colored (not green) and fragrant. Fruit should be firm but slightly soft to the touch. Avoid peaches with green around the stem end. They may have been picked too early and probably won’t ripen well. You definitely want ripe peaches for making jam. If they’re not quite ripe when you buy them, they can be ripened at room temperature, stem-side down, until the flesh feels soft when pressed and they become somewhat fragrant. Place chopped peaches in the bowl of a food processor and pulse until you have a chunky puree. Alternately, you can mash peaches with a potato masher. You should have approximately 3 1/2 cups of puree. Pour the peach mixture into a large bowl. Stir in lemon juice and vanilla. Add the sugar and stir until dissolved. Gradually add the pectin, whisking it in as you go to avoid lumps. Spoon the jam into clean jars, leaving 1/2 inch of headspace at the top of the jar. Allow the jam to sit at room temperature for about 45 minutes to set. Store in the refrigerator for three weeks, or in the freezer for up to one year. Makes four 8 ounce jars. Who Dished It Up First: Adapted from Southern Bite.